The ESI MAYA44 eX is a premium-grade 4x4 PCIe audio interface boasting a built-in 24-bit/96kHz AD/DA converter. The ESI MAYA44 eX Audio Interface includes 4 simultaneous input and output channels as well as a Hi-z instrument input and a microphone preamp with integrated 48V Phantom Power. The Maya44 eX is optimised for home recording on a professional level, as well as being ideal for studio settings. It also boasts digital connectivity with the S/PDIF optical I/O as well as a headphone output for private monitoring. In total, the interface includes 2 stereo analog line inputs and 2 stereo line outputs, making it one of the most versatile PCIe audio interfaces on the market. 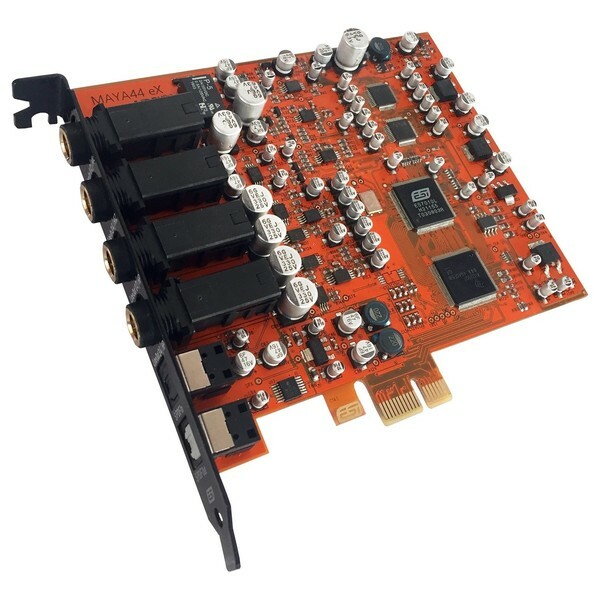 The ESI MAYA44 eX 4x4 PCIe Audio Interface is a premium-grade interface card for professional recording applications. The MAYA44 eX boasts an integrated 24-bit/96kHz AD/DA on-board converter. This high sample rate converter ensures optimal audio fidelity for all inputs, maintaining the natural harmonics from your source audio for studio-grade recording capabilities. The highly affordable interface is compatible with a wide range of Windows operating systems for added convenience. Additionally, the interface comes complete with a software package including intone 2 ESI Edition, ampLion Free and GK Amplification 2 LE plugins as well as Deckadance LE by Stanton; giving you everything you need to get started. The versatile interface also features a wide range of analog and digital connectivity including a built-in microphone preamp, complete with +48V Phantom Power. This high-end microphone preamp ensures you capture every nuance of your source material, ideal for capturing studio-grade recordings. In addition to the pristine microphone preamp, there is also a Hi-Z instrument input to directly input guitar signals. This input is ideal for capturing both electric and bass guitars, ensuring it can handle even the hottest of signals. A headphone output is also included for private monitoring purposes, ideal for listening to your recording levels while recording. The MAYA44 eX also boasts a low-latency DWSM driver, offering support for MME, WDM, DirectSound and ASIO 2.0. This highly-compatible driver ensures optimal audio performance and signal transference, ensuring near real-time recording. The interface itself is optimised for modern audio streaming, recording and playback applications, providing simultaneous full-duplex recording and playback. Also included is both a S/PDIF optical output and S/PDIF optical input for connecting digital audio devices together. Boasting 4 input and outputs channels in total, the ESI MAYA44 eX is ideal for a range of professional recording and playback applications. Please refer to the ESI MAYA44 eX Audio Interface please refer to the PDF above.